Hello! Melissa C. here and I can't wait to meet you! Here's a bit about me. I have a BFA in Musical Theater with a minor in piano from the University of Oklahoma. I also became a certified Montessori preschool teacher while living in NYC. I have performed in some great places such as Hershey PA, aboard the MS Maasdam cruise ship, Seoul South Korea, traveling tours and of course, good old NYC! I had the great fortune to be in the original cast of SCHOOLHOUSE ROCK LIVE! on Broadway as well as many other Off Broadway musicals such as the It Girl. Here in Dallas I perform in plays and musicals on a regular basis and I love it!! What gets me excited now is teaching kids, teens and people of all ages to sing or play the piano! I teach in several schools to groups of children and I just love teaching privately! We will have fun learning piano and voice together! For voice students I will teach you everything from classical to Broadway! I design an individual and unique curriculum to meet your needs and goals! After all, we are all different! For my fabulous piano students, I use the Ferber method and infuse a good deal of music theory as we go along! I believe in this curriculum strongly, but I also encourage you to bring in music that YOU want to learn for FUN! Broadway Performer/ Local Dallas Actress! The It Girl! In NYC! I have performed on cruise ships, tours and internationally in various musicals! I now perform regularly in local Theaters! I taught junior High and High School Theatre for two years! Loved it and loved the kids!!! Between NYC and Frisco Texas, I worked for four years as a Montessori toddler teacher as well as the schools music teacher. I also taught preschool music for many years. My 9th grade piano composition! 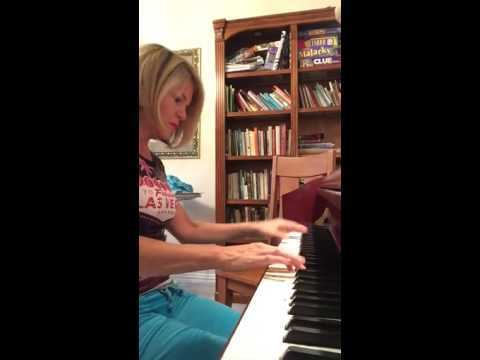 Melissa is a great teacher for kids starting out in piano. Though this is only the first piano teacher we've ever worked with, Melissa has set a very high bar. Her passion for music really shines through during her lessons. She adapts her lesson plans to my 7 year old daughter and moving at a pace that keeps her engaged. She even helps her learn some songs outside the lessons that my daughter started learning on her own! If there are any scheduling conflicts, she keeps the line of communication open and we are always able to figure it out together. We couldn't be happier. If you read through her positive reviews...they're all true! It's only been a month, but we look forward to having her around for a long time. We love her passion for music and teaching. She came well prepare. Melissa started my daughter off on a lesson that was fun and challenging. We are excited for the next one! Totally awesome. Can't wait for next week. Melissa has a great manner with young kids just beginning to learn piano. My son is looking forward to more lessons with her. She knows her stuff and conveys it in a fun way! Melissa is fabulous. My kids love her! Melissa is wonderful. She teaches with positive guidance and allows my daughter to work at a pace that she is comfortable with. Melissa is friendly and knowledgeable. She works well with my kids making lessons fun so they are eager to learn. Melissa has been the most perfect fit for our daughter!! My daughter had gotten into theater, and is now taking voice lessons to help her with choir at her school next year. We are extremely delighted with the results we've seen!! :) My husband says she is a perfect match for our daughter, as Melissa has performed on Broadway, herself! My husband has taken my daughter to her voice lessons these first three times, and I have heard great reviews from both my husband and daughter! I am so pleased with what I've heard, I can't wait to meet Melissa myself! Melissa has been beyond helpful and informative as an instructor. I've taken 3 lessons so far and I can say that I see a big difference in my singing in such a short amount of time. Before taking lessons, I thought I could only learn how to sing in my "head voice" (ex. Phantom of the Opera) but when I started taking lessons with Melissa, she helped me discover my "chest voice". It really amazed me on how much she can pull out of you! I can also say that each time I take a lesson with her, I regain a higher amount of self confidence. I honestly couldn't have asked for a better instructor! Melissa C. is a very good instructor, very patient and gives good feedback, lets me know what my daughter needs to work on. Christian LOVES Ms. Melissa! He is always looking forward to his lesson and loves practicing his new song for "Ms. Melissa". My husband and I are very happy and thankful we found a teacher my son loves and is so patient with him. Melissa is very patient and understanding. We are enjoying our lessons. Madison is definately starting to feel more comfortable singing in front of her. Melissa is a good teacher and is very nice. She is very patient with my children, 5 and 7yrs old. They have really enjoyed having her as their piano teacher. Melissa is a great teacher because she is full of positive feedback. She is helping me build my confidence which has enabled me to break out of my shell and sing to my full potential. Melissa also guides me through my weak areas but it makes me want to rise to the occasion and impress her, it never feels like a criticism. Plus I am learning to read music!! Melissa is a fantastic teacher. My daughter immediately clicked with her and has been so happy to go to piano and voice lessons. She has gained so much confidence in her singing. Thanks for taking Patti as a student. She speaks highly of her experience. Keep up the good work. Kaila is so excited and more confident after every lesson! Melissa is a wonderful teacher and has really helped to boost Kaila's confidence in musical arts! Melissa is a great instructor. She is vibrant and knows how to make the budding singer feel good about herself. She is always interested in what form of music her student likes and will provide that material. Melissa is very nice and a good teacher...the boys really enjoy her! Melissa is great with my 6-year-old. She is very patient, gives instruction in a postive way, and encourages my daughter to have fun while learning how to use her singing voice. Thank you, Melissa! Great job Melissa!! I appreciated your critique and comments.